Hazel and Heather first ‘met’ in 2013 after being introduced online by their agent. The two hit it off instantly, and in early 2015, Heather approached Hazel about contributing to an anthology: FALL OF POPPIES – Stories of Love and the Great War. As Fall of Poppies was nearing completion, both felt there was more they wanted to say about the First World War and the idea to co-write a historical novel began to take shape, despite the obstacles presented by them living in different time zones, in different continents! When FALL OF POPPIES released in March 2015, Hazel traveled to the U.S. as part of the book tour. The two had their first face-to-face meeting in a hotel room in Connecticut (amid much squealing), and after several days of trains, car rides, events, cocktails and laughs, became the best of friends. At the outbreak of war in 1914, it was famously declared that it would be over by Christmas. It was this fact which led to the idea of a group of friends making plans for that Christmas in 1914 – plans which become horribly interrupted. Four Christmases would come and go before the war was over and the soldiers returned home. 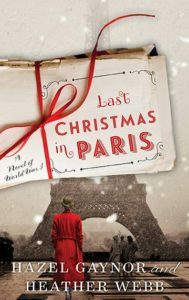 Letters were such a critical part of the war – the only way loved ones could keep in touch – so it felt right that LAST CHRISTMAS IN PARIS would be written as an epistolary novel. The book was written through a literal exchange of letters. Hazel would wake up in Ireland, pen a letter from one of her characters, and wait for a reply. Several hours later, Heather would wake in the U.S. to find mail in her inbox. She would respond in kind, sending her characters’ words over the e-waves. The process felt so organic the story flowed! Of course, having a writing partner demands a lot of trust and commitment. Hazel and Heather navigated the pressures of juggling individual writing projects, and the demands of family life along the way as well. Often, one would contact the other to explain a delay because the kids were sick, or the heating was broken, or some other crisis got in the way. Skype chats and Google Hangouts became weekly powwows to flesh out plot snags and character arcs. Writing this novel has made Hazel and Heather long for a return to the hand-written word. It is only because of the permanency of the letters written during the war that we are able to understand so fully its impact on those who lived through it. Shortly after starting work on the book, Hazel was given a packet of letters written from her great-grandmother to her son, Jack, during WWII. The letters were returned, addressed ‘To Mother’ after Jack went missing in action. He was never found and the family still don’t know what happened to him. To have this piece of family history is amazing, and to see the outpouring of emotion and the little snippets of daily life at that time is something to be treasured. Writing can be a lonely process, so Hazel and Heather found it a wonderful experience to share the process with someone else. Last Christmas in Paris was a challenge to write in so many ways, but a complete joy in so many others. And the best part? In writing “The End,” they not only completed a book, but also made an incredible friend along the way.